Active GPS bulkhead mount antenna, 200 mm length RG316 cable with SMB connector. 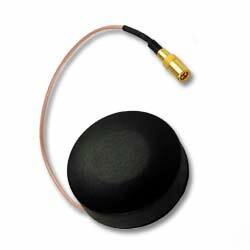 The antenna is waterproof and is designed to work with a variety of GPS receivers. Center Frequency 1.575 GHz, 50 ohms, 3-5 VDC and a gain of 28 dB at 3.0 volts.